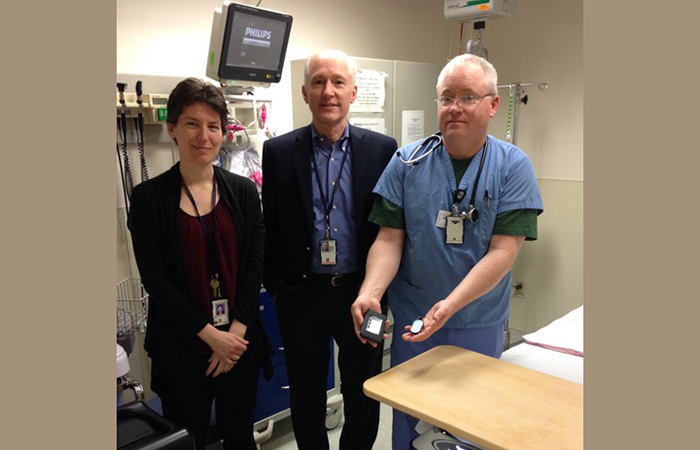 Haley Hunter-Zinck and collaborators at the VA Boston hospital emergency department piloted a project using Amazon Dash buttons to track hospital operational processes. As a Health Science Specialist at the VA Boston Healthcare System, Haley Hunter-Zinck combines her bioinformatics skills with her passion for helping people create tools that help doctors make decisions on patient care. Haley Hunter-Zinck wanted to apply her skills in computational biology to help people but wasn’t sure which career path to focus on. After forming an informal career-focused discussion group with her classmates during her PhD, she developed an interest in medical informatics. She gained experience at the Federal University of Rio Grande do Sul (UFRGS) in Brazil before becoming a Medical Informatics Fellow at the Veterans Affair (VA) Boston Healthcare system. She now uses her informatics skills to interpret patient flow data to help doctors and hospital staff make better decisions about hospital management at the Boston VA hospitals. How did you become interested in pursuing a career in medical informatics at the VA? I was always interested in doing something that would help people. Medicine seemed like a great way to do that, but I was never interested in becoming a physician. I always enjoyed doing research, and I pursued a PhD that focused on deriving new methodologies to associate genes and disease. It was a time where the field was moving away from the technique I was using, and I became less interested with where my research was going. I decided to find out what careers were available to someone trained in computational biology, and I picked up a book called Careers in Bioinformatics. The last chapter was about medical informatics, and the brief introduction caught my attention. After a year of working with a hospital in Brazil, I found an opportunity to do a medical informatics fellowship with the Department of Veterans Affairs (VA) Boston Healthcare System. Medical informatics combines the rise in electronic health records with machine learning and data analytic tools. The VA has the largest health care system in the US, and it has a consolidated database and medical resources. The amount of data and the application of the analyses were too much for me to resist! All of these elements together drove me towards pursuing a career in medical informatics—but it was a chance encounter on a book that led me to this path. What are your responsibilities as a medical informatician at the VA? I am a data analyst; I develop machine learning tools and interfaces to improve the management of patient flow at the Boston VA Hospital. The hospital provides healthcare for veterans with economic needs or service-related disabilities. I explore data sets, run code, process data, and implement machine learning algorithms to analyze and predict patient flow. I spend time developing interfaces that visualize data and then communicate these tools to stakeholders and clinicians that I work with. In addition to data analysis, I also get to attend operational meetings for the hospital. I attend the morning reports, where heads of the different departments get together to report on the current state of the hospital. Through these meetings, I get to actively engage in a live clinical environment. What are the most rewarding and challenging aspects of your position? 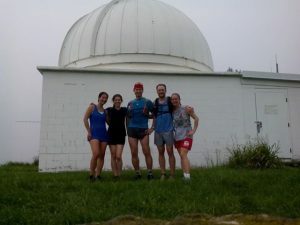 Hunter-Zinck and graduate school classmates on a run to the Hartung–Boothroyd Observatory on Mount Pleasant. I worked on a project during my fellowship designed to create a visualization tool that made images to represent metrics on patient flow in the emergency department. This was a very rewarding experience because the tool allowed doctors and staff to make decisions about how many beds to keep in the urgent care center. Using my tool, they were able to visualize how many patients were at the emergency department at any given time of the day, which showed that they needed to hire more nurses to improve care. Never in my life have I had as much excitement about anything that I created as this little visualization tool! Being able to help people make decisions to solve problems in a hospital environment that affect real people is the most satisfying aspect of this position. Projects that are rooted in the history of the agency have a lot of paperwork associated with them, which can be a big challenge. Changes can sometimes take years to implement, which can be discouraging when there are motivated people who are excited to implement a tool. How do you use skills that you gained during your PhD in this position? When I started my work at the VA, I was surprised at how similar it was to being in academia. I still processed genotype data, analyzed population structure and relatedness, and conducted GWAS. In my current position analyzing patient flow, I continue to use the programming and data analysis skills that I gained during my PhD. I also still apply for grants, attend conferences, submit abstracts for talks, and publish papers to disseminate the knowledge we are generating—though there is less of an emphasis on publication. How can early career scientists prepare for a position in medical informatics? I’d recommend taking a Coursera class and reading issues of journals such as the Journal of Biomedical Informatics to get a sense of what projects people are working on. These are low commitment ways to engage with the field. Then, if you want to get your hands dirty, you can analyze publicly available data, such as those shared by the CDC. The next step is to reach out to connections you have who are in the field to see what their day-to-day is like. For example, when I first found the Advanced Fellowship for Medical Informatics at the VA, I had no idea you could do research at the VA. I contacted individuals through my network on Versatile PhD, and two out of the three people I contacted got back to me immediately saying that they love working at the VA. If you are interested in a career at the VA, you can apply for the Advanced Fellowship for Medical Informatics. There are many ways the data at the VA could be analyzed to improve care, and we are hoping to recruit more people through the medical informatics fellowship program, so we can have meaningful use of electronic health records. What are some experiences you gained working abroad in Brazil? 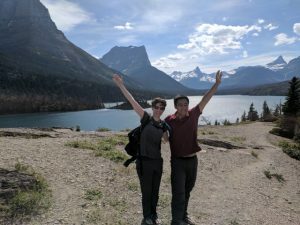 Hunter-Zinck and a friend at Glacier National Park. One of the biggest things I noticed living in Brazil was the different perspective on work-life balance. I felt pressure in the US that work is foremost, that it is acceptable to work until you are miserable, and that if you are enjoying your life too much, you are not working enough. There was a noticeable absence of that mentality in Brazil, which helped me learn a greater appreciation for life. Do you have advice for trainees who are having a difficult time choosing their career path? What was most helpful for me was the realization that I didn’t have to make career decisions alone. I found colleagues at my graduate school who were also interested in different careers, and we got together regularly during the last year of my PhD to talk about our career plans. We discussed what we wanted and did not want in the future, and our strengths and weaknesses. These discussions gave us the opportunity to formalize our thoughts with like-minded people. Once we had an idea for the kinds of positions we wanted to pursue, we would set deadlines for each other for looking up job postings and reviewing CV and cover letters. This support was really helpful in thinking about my career path, and it made me realize that I didn’t have to make decisions in a vacuum.